Indianapolis, IN- EMT, a leading supplier of emblematic jewelry, awards and promotional products, announced today that one of their most popular new products of 2016 will be included in the gift bag given to the nominees at the Academy Awards on February 28th. Promo Loops(Petite Loop and the Ninja Loop)fit any mobile device and their cases and prevent unfortunate cell phone drops by securing the device around the hand or wrist. The full color sublimated imprint makes the product versatile for any company, organization, cause, or occasion. Promo Loops are lightweight but strong, and attaches securely to any mobile phone or case. For more information about Promo Loops, visit www.emteasy.com. Ninja Loop inventor Jean-Philippe Brousseau was on All In A Day to explain how his smartphone invention ended up in the Academy Awards gift bags. Purposes: Perfect for travel, a night on the town or sporting events. 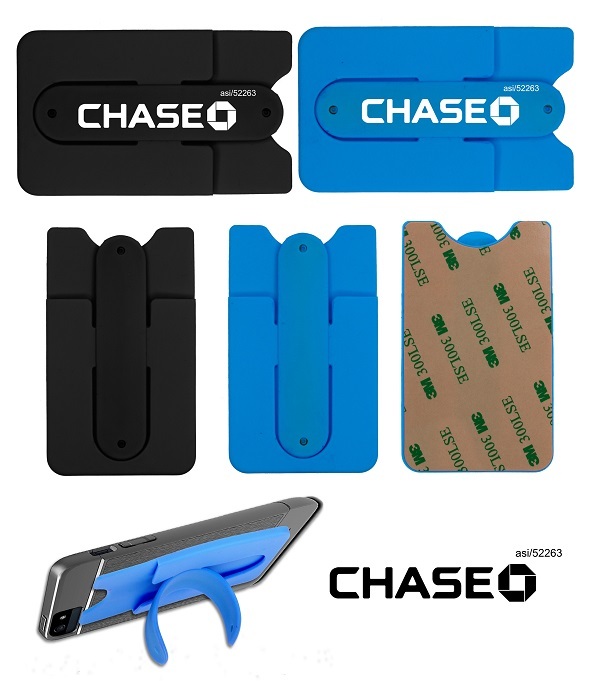 The Silicone Cell Phone Wallet with Screen Cleaner holds credit cards, business cards, hotel keys and provides a removable screen cleaner to clean electronic devices. Objective: To provide customers who are starting a new premium checking and/or savings account an affordable promotional product to brand the financial institution and a new online application that would allow anyone to do everything from cash checks to transfer money from a smart phone. Strategy: A major banking institution launched a mobile application revision and also wanted to provide a gift to their premium checking and savings account members. The item needed to be small enough to fit into the introductory folder/envelope that would be handed out or mailed after a new premium account was opened. Overall, even though the bank was regularly providing new functionality to the application—such as a simplified navigation menu and to request replacement debit or credit cards, it would seem that an alarmingly low number of bank customers were taking advantage of the new phone application. After the bank began passing out the cell phone wallet with screen cleaner, the application saw a 15% increase in users just the first month. Please check out today, “The Promotional Pros Daily.” EMT’s cell phone accessories were featured. Let EMT Dress up your cellphone! Email customercare@emteasy.com for a free sample! 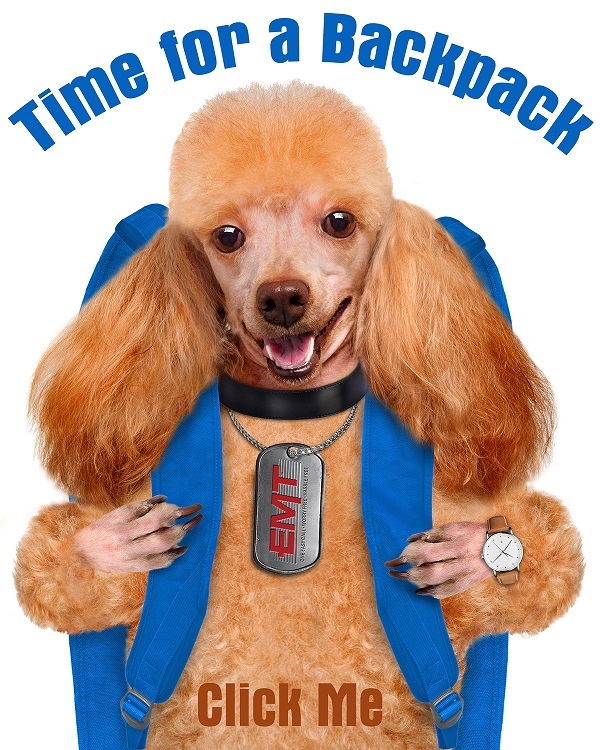 Indianapolis, IN- EMT, the 2014 Distributor’s Choice for Jewelry, Emblems & Patches announced today a new line that they’ve added in 2014: Cell Phone Back Packs. 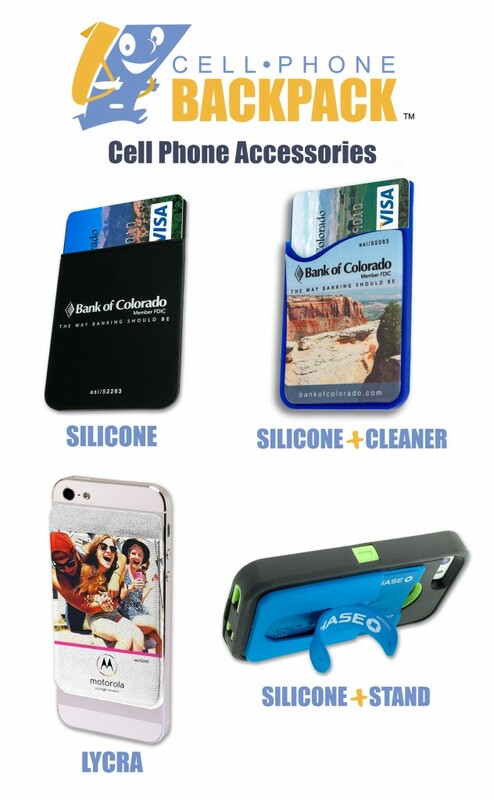 The new cell phone colorful silicone wallets adhesively fit most flat back smart phones for quick access. They are perfect for work, a night on the town, or sporting events. Great for: Credit cards, business cards, hotel keys and more! Stock colors include red, blue, white and black. Custom colors available. It’s time for a new backpack! 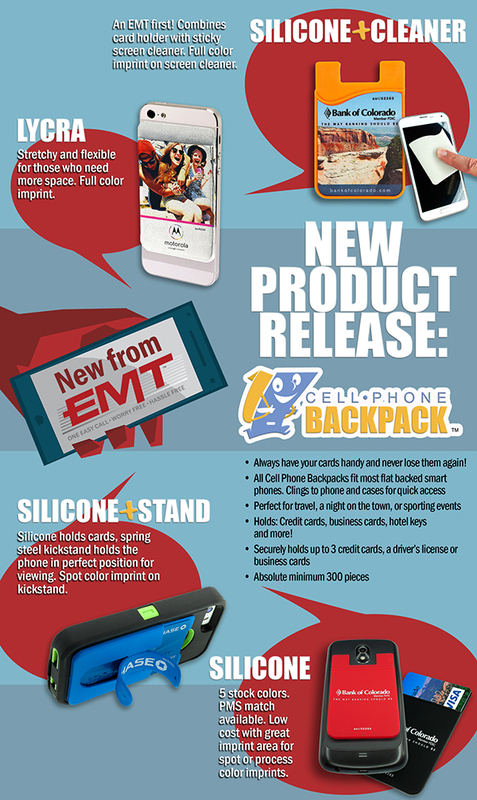 New Product Release: Cell Phone BackPack Products from EMT! Be sure to check out EMT’s brand new cell phone backpack line. Purposes: Perfect for travel, a night on the town or sporting events. The Silicone Cell Phone Wallet with Stand (Kick Stand) holds credit cards, business cards, hotel keys and more in landscape or Portrait perspective. Strategy: A major banking institution launched a mobile application revision and also wanted to provide a gift to their premium checking and savings account members. The item needed to be small enough to fit into the introductory folder/envelope that would be handed out or mailed after a new premium account was opened. Overall, even though the bank was regularly providing new functionality to the application—such as simplified navigation menu and request replacement debit or credit cards, it would seem that an alarmingly number of bank customers were taking advantage of the new phone application. Just one month after the bank began passing out the cell phone wallet with kick stand, the application saw an 15% increase in users just the first month. In addition to this, the colorful stand is also very practical and the imprint very noticeable. Stock colors include pink, light blue, white and black. Custom colors available.